Weird Pictures! You might know Toronto artist Mike Parsons, AKA, Hey Apathy! from his street artwork on Queen West. Whether his distinct black-and-white drawings are on pavement, canvas, or paper, they generally revolve around the city. 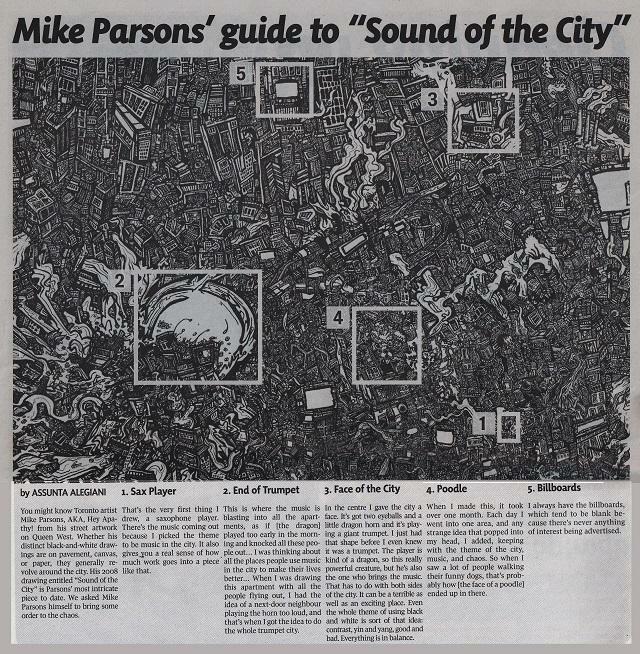 His 2008 drawing entitled “Sound of the City” is Parsons’ most intricate piece to date. We asked Mike Parsons himself to bring some order to the chaos. That’s the very first thing I drew, a saxophone player. There’s the music coming out because I picked the theme to be music in the city. It also gives you a real sense of how much work goes into a piece like that. This is where the music is blasting into all the apartments, as if [the dragon] played too early in the morning and knocked all these people out… I was thinking about all the places people use music in the city to make their lives better… When I was drawing this apartment with all the people flying out, I had the idea of a next-door neighbour playing the horn too loud, and that’s when I got the idea to do the whole trumpet city. In the centre I gave the city a face. It’s got two eyeballs and a little dragon horn and it’s playing a giant trumpet. I just had that shape before I even knew it was a trumpet. The player is kind of a dragon, so this really powerful creature, but he’s also the one who brings the music. That has to do with both sides of the city. It can be a terrible as well as an exciting place. Even the whole theme of using black and white is sort of that idea: contrast, yin and yang, good and bad. Everything is in balance. When I made this, it took over one month. Each day I went into one area, and any strange idea that popped into my head, I added, keeping with the theme of the city, music, and chaos. So when I saw a lot of people walking their funny dogs, that’s probably how [the face of a poodle] ended up in there. I always have the billboards, which tend to be blank because there’s never anything of interest being advertised. This article appeared in the printed version of the Varsity Magazine and can be read online here.